It is a guide which the writer intends to provide lawyers “with the language, arguments and practical solutions which are needed to make this happen”. 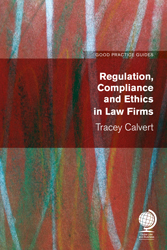 Tracey Calvert succeeds brilliantly in her advice to us on modern regulation. Regulation, compliance and ethics are the three common features of all well-run law firms. Without an understanding of regulatory expectations, compliance duties and ethical behaviours, a firm runs the risk of censure, adverse publicity, and client dissatisfaction. It is essential that law firm owners and managers acknowledge and have strategies to accommodate risk management, regulatory and legal compliance and ethical values in their business. They must also have a common understanding as to how this will be achieved. This guide is intended to provide lawyers with the language, arguments and practical solutions which are needed to make this happen.